Here we are. At the end. I started this a little more than two years ago but I finally made it to my stated goal of issue 100 of White Dwarf. 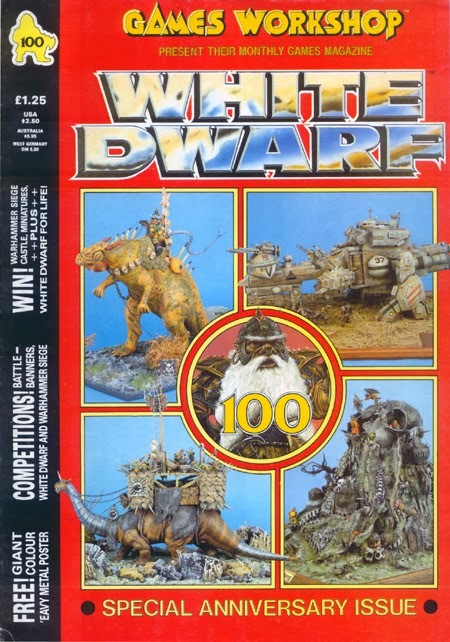 But before I go all reflective, let's tackle the issue at hand, White Dwarf 100 for April 1988. The cover of this issue includes photos of miniatures, which I guess is appropriate. 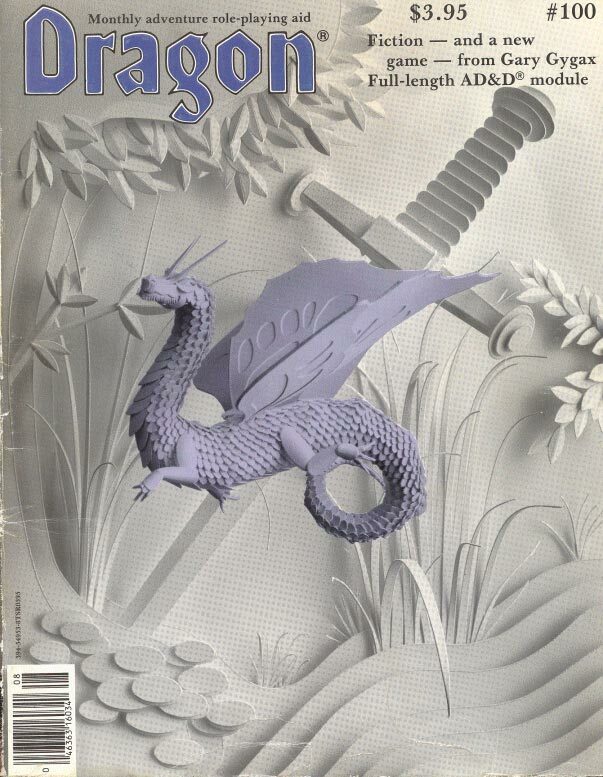 Compare to the cover of Dragon 100 it really isn't a stretch; both did something different. But with a history of great covers I expected more. This is a common theme throughout this issue in fact. Unlike issue #90 (ten years) which featured a look back, this issue is nearly indistinguishable from the last save that there is no other game content except for Games Workshop games. Now I don't want it to sound like I think this is a bad thing. It's not. TSR/WotC did it, most magazines did it and still do it. It's good economic sense. I like generalist magazines myself and once upon time White Dwarf was the best of the lot. Sean Masterson makes it clear that issue 100 is not about looking behind, but ahead. Ok. I was hoping for some retrospective, but I am not going to fault them. This is the blueprint of next 25 years of White Dwarf. It wouldn't bug except for the teaser of "Special Anniversary Issue" on the cover. Marginalia discusses The Power Behind the Throne for Warhammer Fantasy Role-Play and another expansion to Dungeonquest. I think I am going to need to pick up both WFRP and Dungeonquest at some future date just to see what they were all about. Highway Warriors is a sneak peak into GWs next near future game. At this point it was unnamed, but a little research and I found out it became Dark Future. I love reading little insights like this to games. I remember about the same time reading about the upcoming AD&D 2nd Edition. It was articles like this that got me thinking about what sorts of things went into making a game. The Floating Gardens of Bahb-Elonn is an adventure for Warhammer Fantasy Role-Play. I can't judge it on it's own merits. The players are all some sort of native race with some dumb sounding names, but outside of that it looks like an adventure that could be ported over to any system. I could see it being run with primitive halfings in D&D or MERP. The rest of the issue is split up between Warhammer Fantasy Battles and Warhammer 40k. In fact the only clue that there are other games out there is an ad for Dragonlance Tales vol. 1 (of all things). Here at the end (not to sound too maudlin) I can see how this magazine is changing into something that Warhammer fans will find useful. Plus it is also a good example how a company can maintain seperate parallel game lines. But it is a good place for me to bow out. That things really have not changed all that much. Some of the same discussions on the letters pages and int he editorials are the same as some message board and blog posts today. Each generation of gamers looks at the generation that cam before as old Grgonards and at the generation that comes after as kids with no respect for the way things were done. Debates will always rage on and maybe it not the goal of the debate but simply the discussions themselves that are important. I learned that it doesn't matter what I think I know about games, there is always more to learn. A new game, an obscure one, new ways of doing things. This hobby is more diverse than even we give it credit for. I learned that there was a ton of great stuff being published back then. I was fortunate to have lived in a area where I still had pretty good access to games. I now live in a place where any game I want is often a mouse click away or if I need it sooner in physical form, an 8-minute drive. What I most enjoyed though was going through the older magazines, the ones up to issue 30-40; the Golden Age of RPGs or at least of D&D. Yes I can be accused of being an old nostalgic gamer and that is fine with me to be honest. I also liked reflecting on what I was doing at those times as well. That was a lot of fun. I hope you all enjoyed it as much as I did. I suspect that sort of "young vs. old" is endemic to most human pursuits. There are grognards or accusations of grognarddom, everywhere. Bravo! A mighty feat, sir. To save anyone the bother, Warhammer RPG stuff continues until about issue 105/106 and from then onwards (at least untill 110 which was a far as I bothered going) it's wargames all the way. It's funny, I found the same sense of anticlimax as you with issue 100 - issue 90 (which was also 10 years) had much more going on, and even that was really one article by Ian Livingstone. I agree, issues 30-40 are probably the highlights. I'd extend it, between about 21-59 or thereabouts. The early issues are just too early (although the Albie Fiore adventures are good), and the quality tails off slowly and steadily from the 60s onwards. Although there are still some okay articles, the feel is never quite the same and I'm still not sure what it exactly is that causes that. Not quite; there's WFRP content all the way up to #140 and then that's the end of the rpg content. I think that my favorite "pre-release" tidbit was that, when the game that ultimately became GURPS (Generic Universal Role Playing System) was being designed, they were calling it the "Great Unnamed Role Playing System". I haven't seen anyone reference that since those days, but it was interesting to watch the discussions that were going on at the time. Which has nothing to do with White Dwarf, really, but your comments reminded me of it. When Alexander the Great had been campaigning for 13 years he cried salt tears because there were no more worlds to conquer - you've achieved the same in only 2 years! Fantastic job. Thanks very much. My Thursday mornings will never be the same again.